Background: A species’ shape and size can tell you a lot about how the animals are doing in their environment. For example, species tend to get larger at cooler temperatures, a phenomenon known as “Bergmann’s rule”, and they tend to have greater dispersal traits where they need to move further (such as locations where habitat patches are further apart). What we did: I was interested in shape and size varied between a species that is not moving north under climate change (Pyrrhosoma nymphula, shown above) and a species that has been expanding its range into Scotland (Coenagrion puella). I collected animals at a series of sites from southern England to Scotland for both species. The results showed that there was little consistent variation in size or dispersal traits in P. nymphula but that C. puella showed increases in size and the relative investment in the thorax and abdomen (indicative of greater flight ability). These results, taken together, suggest that there has been selection for dispersal traits in the expanding C. puella. Importance: The presence of traits that could facilitate response to climate change, such as enhanced dispersal to increase colonisation of new habitats, could make the difference between a species thriving or failing under climate change. This is particularly important for species that rely on aquatic habitats for their life cycle, because water resources are predicted to be under increasing threat in the future. This is part of a series of short lay summaries that describe the technical publications I have authored. 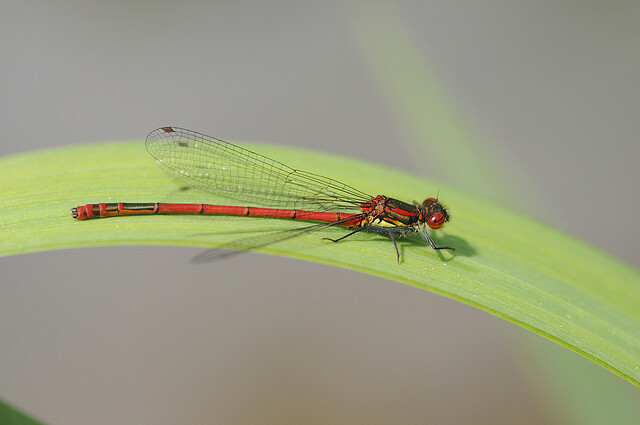 This paper, entitled “Latitudinal variation in morphology in two damselfly species with contrasting range dynamics”, was published in the European Journal of Entomology in 2008. You can find this paper for free online at the publisher.